High quality rotomolded scoop slide compatible with most play sets. Designed for a 5' high deck this slide comes out 7' away from the fort. High quality, durable and easy to install slide for any playset! High quality and heavy duty rotomolded scoop slide compatible with most play sets. Designed for a 5' high deck this slide comes out 7' away from the fort. 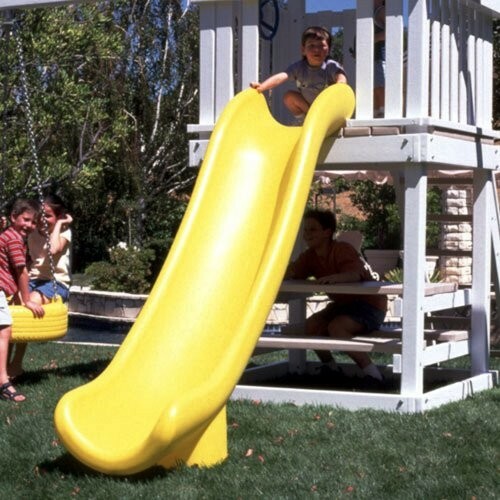 High quality, durable and easy to install slide for any playset! KidBouncer.com is an online retail store that is all about kids. We strive to promote safe play for kids of all ages through outside activities. We guarantee all of our products against Manufacturer defects. Our goal is 100% satisfaction from our customers. We continue to grow thanks to your support and loyalty. Our product lines will focus on kid friendly items that are fun to play with and stimulate balance and a healthy lifestyle for our kids.